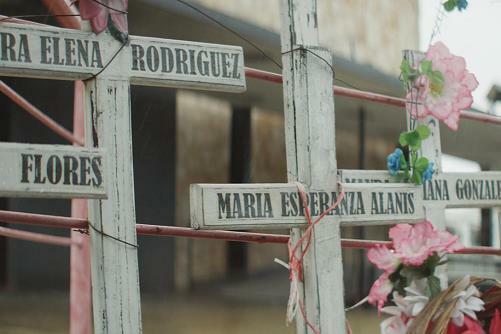 The most haunting images in the drug war documentary Kingdom of Shadows are at the film's end. Family members of the "disappeared" -- those who have vanished amid the drug-related violence in Mexico -- stare silently into the camera, the pained but stoic looks on their faces reminding us of the drug war's human toll. Many documentaries have chronicled the drug war in the U.S. and Mexico, but few have humanized it as poignantly as Kingdom of Shadows. While the film explains some of the politics and history of the endless battle against the drug cartels, it also puts an unforgettable face on the war's tragic effects by focusing on three people caught up in it. The three defy stereotypes. Sister Consuelo Morales may be a petite nun in her sixties, but she's fierce and fearless in her quest to help families whose loved ones have disappeared. Based in Monterrey -- a Mexican city battered by the cartels -- and founder of the activist group Citizens in Support of Human Rights, she is unafraid to stand toe-to-toe with government officials, pressuring them to find the missing and help the families find justice. If Sister Morales is an unlikely crusader, Don Henry Ford, Jr. is an equally unlikely smuggler. The aging rancher spends his days quietly tending to his pastoral South Texas ranch, but in the 1980s he boosted his farming income by smuggling thousands of pounds of marijuana across the border. Ford lends historical perspective to the film: In the days before the cartels took over, he was one of many small-time smugglers who did business with major Mexican narcotraficantes without fear of violence. Kingdom of Shadows' third subject, Oscar Hagelsieb, makes his first appearance covered in tattoos, sporting a long goatee and cruising on a tricked-out motorcycle. We soon learn that he's a high-ranking Department of Homeland Security officer based in El Paso. A child of undocumented immigrants, Hagelsieb grew up in a drug-ravaged neighborhood and spent much of his career as an undercover drug agent. Filmmaker Bernardo Ruiz, born in Mexico, has devoted his career to documenting life on the border and the U.S.-Mexico relationship. Thanks to his intimate knowledge of the region, Kingdom of Shadows is a strikingly intimate film. Its three main subjects are completely candid, and Ruiz and his collaborators gained remarkable access to many other people involved in the drug war, filming everything from the normally off-limits workings of Homeland Security to Mexican police training exercises to a horrifying interview with a masked member of Los Zetas cartel. Kingdom of Shadows has its share of grisly footage -- bloody murder victims, corpses hanging from bridges and scorched bones. But the movie's images of ordinary life are even more effective. As we see Morales meeting with impoverished widows and government officials, old photos of Ford on his ranch and Hagelsieb at home with his family, Kingdom of Shadows shows us how deeply the drug war has infiltrated our culture and how closely the violence coexists with peaceful, routine life. The nun with political connections has seen the bloodshed firsthand in her neighborhood. When not working his ranch, the rancher was hauling truckloads of pot. And if a drug bust went wrong, the father at the dinner table could easily have been killed on the job. Speaking of imagery, Kingdom of Shadows is a surprisingly beautiful film given its subject. Ruiz and his cinematographers use the stunning big-sky landscapes of northern Mexico and South Texas to great effect, juxtaposing wide-angle shots of Ford's verdant ranch and broad, dusty Mexican horizons with more conventional documentary talking head footage. Kingdom of Shadows is more observant than crusading; it's rooted in first-rate journalism, not any blatant political agenda beyond educating and inspiring audiences. It does, however, have a message: The drug war is a bewilderingly complicated and intractable problem that involves many of us in ways we don't realize. Morales, Ford and Hagelsieb make this point with great poignancy and humanity, and their stories make Kingdom of Shadows a terrific documentary. The three have little in common, but they do agree that the crisis has many causes -- extreme poverty in Mexico, U.S. drug laws that do nothing to curb drug use, corrupt politics on both sides of the border, and a harsh culture that inspires people, as Ford says, to self-medicate with illegal drugs. They also agree that a problem so complex has no easy solutions. Austin/Texas connections: Kingdom of Shadows was filmed in El Paso and other locations along the border. Don Henry Ford, Jr. lives in Belmont.